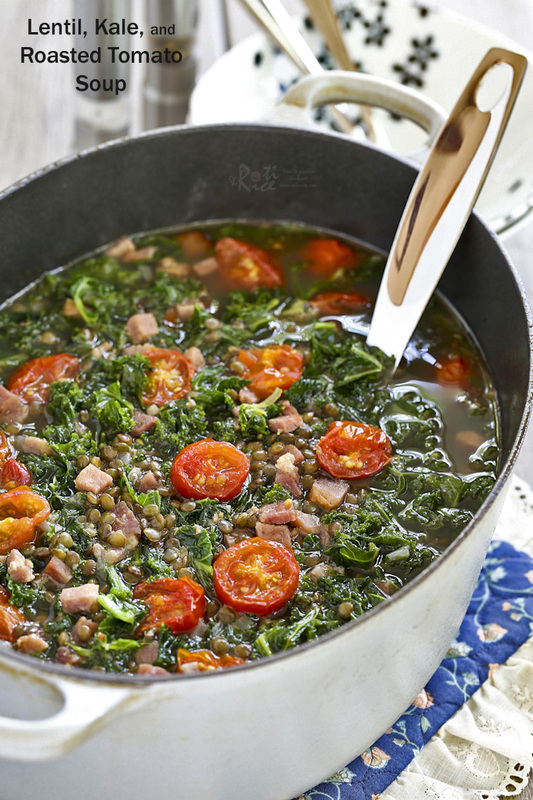 This Lentil, Kale, and Roasted Tomato Soup is super tasty and nutritious. Serve it as is or with crusty bread for a totally satisfying meal. It has been raining almost every day this past week. The cooler temperature (high 60’s and low 70’s) calls for something warm and comforting for the belly. 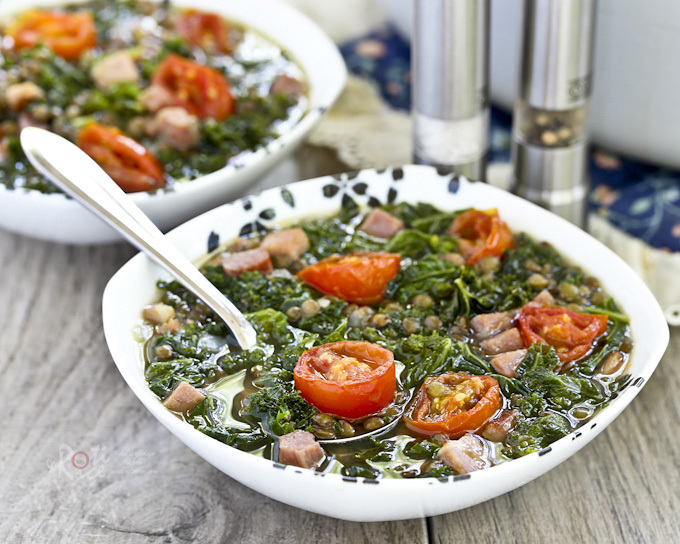 With another good harvest of cherry tomatoes from the vegetable garden, I made this Lentil, Kale, and Roasted Tomato Soup for dinner one evening. It was super tasty and totally satisfying. We had two helpings each. 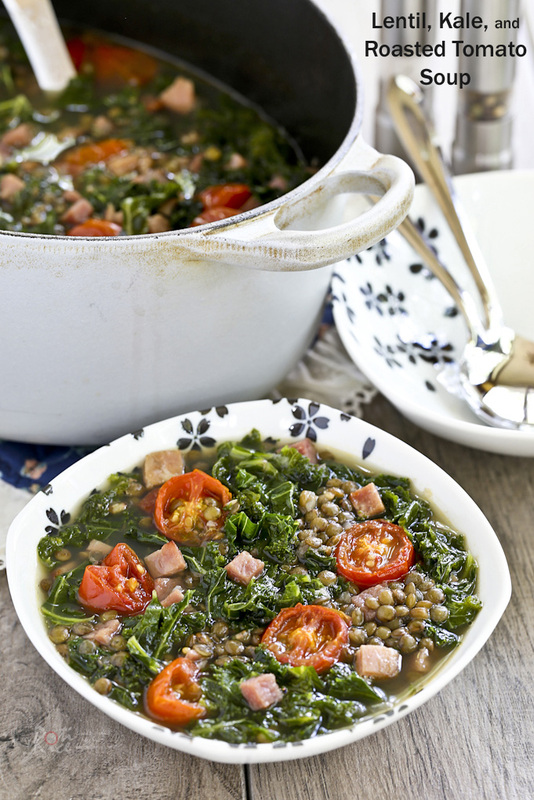 For this soup I used puy (French green) lentils which I had recently purchased at the health food store. These are small, slate green lentils with a delicate blue marbling. They have less starch and do not get mushy when cooked. Just what I wanted in this wholesome and hearty soup. The lentils kept their shape even after 40 minutes of simmering and the soup remained clear. They were nice and tender but not mushy. If you prefer them to be a little firmer, you can stop cooking after 30 minutes. Heat 2 tablespoons olive oil in a large heavy bottom pot. Fry onions and garlic until soft, about 2 minutes. Add puy lentils and bay leaves. Give it a stir, and then pour in ham stock. Cover and bring to a boil. Reduce heat to low and simmer for 40 minutes. Place tomatoes and ham in two separate trays. Drizzle remaining tablespoon of olive oil over tomatoes. Roast in a 400°F (200°C) oven for 40 minutes. Season soup with salt and pepper. 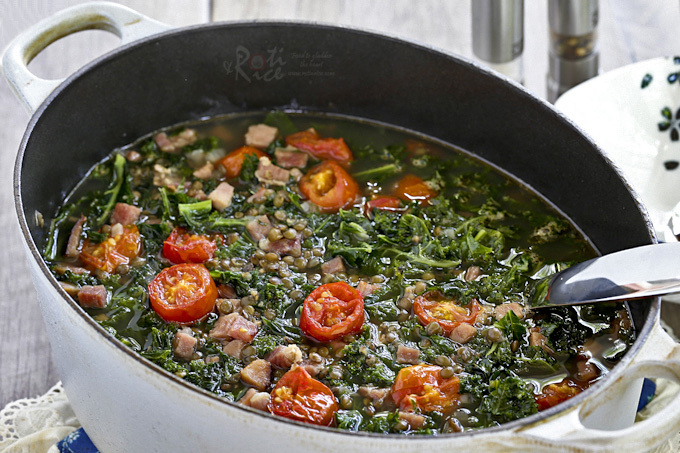 Add kale and continue to cook for 3 minutes. Remove roasted tomatoes and ham from oven. Add both to the soup. Give it a good stir and turn off the stove.